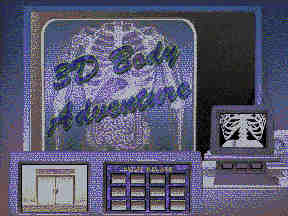 Body Adventure has 3 major sections: a body imaging area, a movie theater, and a games component. The body imaging area consists of a screen showing a rotatable skeleton, with the ability to highlight different body systems. Manipulation of the body via movements of the mouse takes a little experimentation. Some portions of the body can be zoomed in on, for a closer examination, for example the ankle, eye or heart. These manipulatable close-ups are excellent, almost giving the feel of a real object! A reference screen also allows users to search for body parts by name, and read and/or hear about them. Our reviewers only concern with this area of the package was in its spotty coverage -- what's here is good, but there are many major topics left uncovered. This makes 3D Body Adventure better suited as an introductory tool designed to whet the student's appetite for more knowledge, rather than for repeated use as a text or reference source. The movie theater section contains over a dozen computer generated "fly-throughs" of body systems, like the digestive tract, the circulatory system, and the brain. Although unfortunately not interactive, the graphics here are amazing. Without, our reviewers noted, using the gimmicky 3D glasses. Body Adventure also includes two interactive games. The first is a simple "concentration" matching game for body parts. The second is an emergency room game where the user "treats" patients by such means as zapping fat deposits in their blood vessels with a ray gun. We think Knowledge Adventure should consider zapping this game. Overall, our teacher reviewers felt that the greatest value in 3D Body Adventure was that it offered the potential to excite or interest children in human anatomy, through several of its impressive graphics displays. The product's packaging suggests potential use by ages 8 to adult. Although that's certainly possible, 11 to 15 year-olds seem like a sure bet, especially if they've demonstrated any interest in the human body. This is a PC-only title. or redistribute in any form without prior written permission.